I’m not here to recommend a particular stove or brand of stove. I’ve found over the years that a stove that works for one person, doesn’t work at all for someone else. We all have different ideas of precisely what makes the perfect stove. For example, some people prefer white stoves, while others think that colors are the way to go. The selection of stoves is also limited by local availability and the size of your pocketbook. I’m sure that there are some people reading this who will merrily spend $5,000.00 or more on a stove and never think twice about it. So, I’m not here to tell you that a particular stove is the end all invention of stoves because it probably isn’t true in your case. Stoves used for self-sufficiency purposes, especially canning, do have some features in common though and that’s the point of this post. Glass top stoves are completely out of the question if you want to can. Even the vendors will tell you that placing a heavy canner on a glass-topped stove is doomed to failure (or at least breakage of the top). That said, I know of at least one person who uses their glass topped stove for canning, quite successfully I might add. Still, it’s probably not a very good idea and forget about any warranty work if the vendor discovers that your stove top broke from canning. We tried an electric stove that was specifically designed for canning. The vendor even talked about canning in the manual. This stove came with some high wattage burners designed to heat the water more quickly. The problem is that the electric stove doesn’t get enough air flow to cool the burners (as odd as that might sound) when a big canner is sitting on top of the elements. I ended up replacing the burners almost every year because the metal holding the elements together would sag and eventually the pot ended up resting right on top of the stove (with the resultant fire hazard). After the stove burst into flames the second time (and I was looking at rewiring it yet again), I decided that electric wasn’t going to make it for us. That said, I know of more than a few people who do successfully use electric stoves for canning. Almost every one of them has removed the vendor-supplied burners and provided heavier duty canning burners. AP Wagner is one place that sells these burners—be prepared to pay an arm and a leg for one (a burner that normally runs around $30.00 will cost nearly $80.00 in canning burner form), if you can even find one to fit your stove. That leaves gas stoves. Even here you can make some serious mistakes. Look for a gas stove that specifically mentions canning in the manual. Check out reviews from other people who use the stove for canning purposes. The grates should be quite heavy if you plan to use the stove for canning because a canner is quite heavy (especially when working with a pressure canner). Make sure the grates aren’t so high that they actually prevent good heat transfer to your canner. It’s a good idea to obtain a gas stove that has at least one power burner (more is better). Unfortunately, the power burner will also trash any sort of sauce you try to make with it, so a simmer burner is also a good idea. The stove we finally purchased has one standard burner, two power burners, and a simmer burner. We’re finding that it works extremely well for every task. No matter which stove type you choose, make sure it has a porcelain finish and not a painted finish. Some vendors will try to pawn a painted finish off on you and the paint is guaranteed to peel from the heat generated from canning. Unless you like the idea of repainting your stove with high temperature paint (nasty stuff) on a regular basis, porcelain is the only way to go. Another issue to consider is the size of the back panel. Many stoves have back panels that jut out as a fashion statement. Unfortunately, the back panel design also makes it impossible to use the back burners with anything larger than a small pan. This sort of stove is unlikely to work well for canning purposes (Rebecca and I know, we’ve tried). If nothing else, take your pans to the store and test fit them on the stove before you buy. You really don’t want to discover that your pans won’t fit after the stove is already installed in your home. If you’re using your stove for canning like we do, then you’ll find that it takes a lot of abuse. We bought one with as few gizmos as possible because gizmos tend to break easily when you use them a lot. Simpler is better when it comes to canning. To help make the stove even more reliable, make sure you read the manual that comes with it and perform all of the vendor-recommended maintenance, including the required cleaning. For example, we found out that ammonia really does work better for cleaning the stove than other cleaners. (We tried it as part of the vendor-recommended maintenance.) The ammonia fumes are quite nasty, so we run the hood on high speed during cleaning to remove them. Our results may vary from yours, but we’re also finding that gas is less expensive to can with than electric. I’m still trying to figure out precisely how much less, but my preliminary estimate shows that you save about 17% using gas over electric. In order to come up with a precise number, I’m going to have to figure out how many BTUs are required to perform a typical canning operation on each device, and then compare the per BTU costs of each fuel source. We’ve also discovered that canning with gas takes less time because the water heats more quickly. You should know though that we’re using propane and that could change the economics of canning. Choose carefully if you value long term costs as part of your purchasing decision. What sorts of things have you found important when choosing a stove? Let me know at John@JohnMuellerBooks.com. Considering the New Metro Interface—Ribbon Redux? Microsoft has made it quite plain that the new Metro interface will be the default interface for Windows 8. All one has to do is spend some time looking at the Building Windows 8 blog posts to discover this fact—Metro appears all over the place. In fact, Microsoft is adamant that you will like the Ribbon and Metro whether you want to or not. Of course, this means preparing developers to create applications for the Metro interface. However, the current emphasis is in trying to convince people that they won’t miss out on anything by using the old Start menu interface, but that they’ll really want to use the Metro interface for maximum functionality. Both interfaces use the same low level functionality and rely on the same HTML5 engine. Something that began to worry me though is that Microsoft seems to be espousing an architecture that is more closed and propriety with Metro. For example, they tell you that the Metro-style Internet Explorer interface isn’t going to support plug-ins and that it’s a good thing it doesn’t. When has restricting third party add-ins ever made something better? One of the things that has made Windows a great platform over the years is that Microsoft has encouraged third party additions that make a stronger offering. Anything that Microsoft can’t offer is provided by third parties—users are free to pick and choose what they want as part of their application experience. Microsoft’s decision to close their architecture actually began with the Ribbon. One of the reasons I wrote RibbonX for Dummies and updated VBA for Dummies was to help VBA developers to continue creating add-ins for Office products. (You can read my continued posts about these books in the RibbonX for Dummies and VBA for Dummies categories.) Now Microsoft is closing something else—Internet Explorer—a central part of the Windows experience. I’m not the only one who has concerns about Metro, nor am I the only one who has noted that the Ribbon actually slows power users considerably. A recent ComputerWorld article discusses the problem of both interfaces slowing business users and the fact that Metro will require hardware updates for maximum functionality, despite Microsoft’s protestations to the contrary. I think that the Ribbon does indeed help the less skilled, non-geek, user to become more productive with less effort, but at the cost of hampering everyone else. I’ve learned though to wait to see how things work out. With the Ribbon, I think more people have won than lost, but those who have lost productivity have lost in a big way. Metro may prove to be more of the same. At least you can select the old Start menu interface if desired—Office didn’t offer this option without a third party add-in. What concerns me right now though is that Microsoft added a host of productivity enhancements to Windows 7 that really did make sense. I use many of them every day now and I’ve talked about them in Professional Windows 7 Development Guide. These enhancements apparently go by the wayside when you use the Metro interface, which makes me wonder why Microsoft developed them in the first place. I find that the new Windows 7 enhancements really do work—I’m able to open my documents and get to work considerably faster—I feel much more informed about my work environment. It seems a shame that these enhancements will be left by the wayside if Microsoft ends up making Metro the only option a future version of Windows. What do you feel about the new Metro interface? Is it a productivity enhancement or an impediment to getting things done quickly? I’m curious because I’ll eventually need to update my books for Windows 8. Which interface do I focus on during these updates? When you send your opinion, please let me know whether you’re speaking as a home user or as a business user. Let me know your thoughts at John@JohnMuellerBooks.com. In the previous post, Exploring the GrabAPicture Application (Part 9), I discussed the command line interface for the GrabAPicture application. This week we begin looking at the GUI controls for frmMain, which is the first form the user sees. Here’s how this form appears when you’re using it. It’s helpful to perform such an analysis of any interface you design. Doing so makes it possible to look for ways to make the application more efficient (by reducing the number of controls when possible) and easier to use (by placing some controls on another form). Theoretically, you could make this application more efficient by making the Command Line Interface Configuration part of the command line interface. Likewise, you could make it easier to use by placing the Direct Wallpaper Access controls on a separate form. However, the form is relatively simple as is and most people won’t have trouble using it. This post discusses all four areas in the order shown. Part of the dialog box management task is to configure the form when you first start the application. This application, like most applications out there, uses the Load event to perform the task. In this case, it means using the frmMain_Load() handler shown here.
' access to the current Windows settings.
' Get the current wallpaper URI and display it. 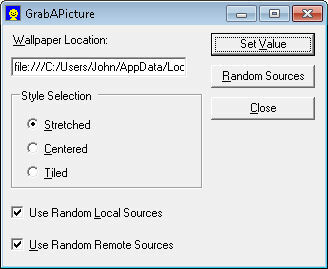 The code begins by creating a global GrabAPictureSettings object, CurrentSettings, that contains the content of the user’s wallpaper database. Normally, I prefer not to use global variables because they’re prone to all sorts of problems, especially when the code your working with could be multithreaded (reentrancy problems are extremely tough to debug). However, using the global variable in this case shouldn’t be a problem. The frmMain_Load() method begins by creating creating a WinWallpaper object, Wallpaper. The reason you must create this variable every time you need it is because external applications can indeed change the wallpaper. If you didn’t create these variable every time, the user could end up using old information. Admittedly, this wouldn’t be much of a problem when it comes to wallpaper, but it’s good practice to follow in every application where an external application could affect your application’s data. The code then uses Wallpaper to set the Wallpaper Location and Style Selection settings of the application. At this point, the code instantiates CurrentSettings. You know from the Exploring the GrabAPicture Application (Part 8) post that the LoadSettings() method returns Nothing when the user hasn’t saved any settings before, which is always the case when the user starts the application for the first time. This code checks whether CurrentSettings is Nothing after the LoadSettings() call. If so, the application creates an entirely new GrabAPictureSettings object. Otherwise, it uses the existing settings to configure the Use Random Local Sources and Use Random Remote Sources check boxes. The configuration process is complete. The only remaining task is to provide a means of ending the application. Clicking Close, which is btnCancel, performs this task. Here is the code used to accomplish this task.
' Exit with the Cancel code. Notice that this application doesn’t simply close the form. Instead, it calls Environment.Exit() with an ending value of DialogResult.Cancel. The purpose for this approach is that GrabAPicture is designed for use in a batch file. Any batch file you create can rely on the ErrorLevel value to detect how the application exited (see my Understanding the Connection Between Application Output and ErrorLevel post for details), so you must provide a value to detect. It’s good practice not to simply close the form anyway—you should always provide some sort of exit value. This application provides the means for the user to simply type the full path to a piece of wallpaper, set the style, and then click Set Value to use it. In short, the user could decide not to use any of the random option at all. There is a command line interface feature to allow the user to work this way as well. Here is the code used to provide direct wallpaper access.
' Set the wallpaper URI.
' Exit with the OK code. Each of the check box event handlers performs essentially the same task. They set the Wallpaper.Style property to the appropriate Wallpaper.Styles value. A possible enhancement to these event handlers would be to force them to make the change automatically. The user still has to click Set Value to make the change. After testing this example out with a few willing volunteers, I found it was less confusing if the application waited for the user to click Set Value, rather than have the change occur automatically. The strategy you pursue will likely depend on your users and the complexity of the application you create. Clicking Set Value calls the btnOK_Click() event handler. In this case, the code performs a conversion of the text the user types into Wallpaper Location to a Uri object. This is the first potential source of an exception. If the text doesn’t form a useful URI, then the application generates a UriFormatException. The assignment could possibly generate other exceptions, so the code adds a general exception handler as well. The act of making the assignment changes the Desktop wallpaper. This example used to close the dialog box automatically after the user clicked Set Value. A few testers complained about this practice—preferring to experiment with the wallpaper. Consequently, the current version of the example has this piece of code commented out. If you choose to enable the old method of doing things, you’ll want to note that the application will exit with a value of DialogResult.OK in this case, which you can easily trap using the ErrorLevel value in a batch file. Wallpaper database configuration is performed using a combination of frmConfigure (to display the database content) and frmAddEdit (to make changes). When the user clicks Random Sources, the application calls btnConfigure_Click(). This event handler displays frmConfigure so that the user can see the list of configured wallpapers and make changes to the list. The following code shows how to perform this task.
' Create a new configuration dialog box.
' Display the dialog box on screen.
' Update the current configuration settings.
' Define default settings if necessary. The first part of this code looks like any dialog box display code you’ve used in the past. The example creates a frmConfigure object, Config. It then calls the Config.ShowDialog() method to display the dialog box with the current dialog box as the parent. A lot of developers create subordinate dialog boxes without the proper parent, which makes the application behave incorrectly. Always assign a parent to a subordinate dialog box when the subordinate should be dismissed before going back to the parent. On return, the user has supposedly made changes to the wallpaper database. With this in mind, the application updates CurrentSettings to match the new wallpaper list. In addition, the wallpaper itself may have changed, so the application updates the wallpaper settings as well. The last bit of code may seem confusing at first, but think about it for a minute. The user might have deleted the last wallpaper entry from the list. If this is the case, the application needs to set CurrentSettings to a new instance of GrabAPictureSettings. The final task for frmMain is at hand. The application needs some method of configuring the command line interface to use the correct random settings. The Use Random Local Settings and Use Random Remote Settings check boxes perform the task. Here is the code for the associated event handlers.
' Save the current checked state. As you can see, the application sets the correct CurrentSettings property, and then calls GrabAPictureSettings.SaveSettings() with the CurrentSettings object as an argument to save the settings to disk. The result is a change to the user’s disk-based XML settings. A side effect of this process is that the user’s wallpaper list is also saved to disk. The SaveSettings() method saves all of the settings at one time. Well, that’s it for frmMain. The next post will look at frmConfigure. Until that time, please let me know if you have any questions at John@JohnMuellerBooks.com. You can find the next post in this series at Exploring the GrabAPicture Application (Part 11). There is a misconception that anyone who works in a farm-like environment simply takes a vacation once the crops are in (no matter what those crops might be). It’s true that I’m slightly less frantic now than during the summer months when I need to be doing three things (or more) at once. However, the work continues throughout the fall and winter. The fall period begins after the garden is cleaned up, tilled, and planted with winter rye. Our winter rye is just showing above the ground at this point. It’ll stay that way until spring, when it’ll take a growth spurt. The winter rye roots will keep our precious soil in place and also provide “green manure” in the spring when we till it under. A lot of people are surprised to see the two buckets of what appear to be shriveled bean pods in our basement, alongside the potatoes and squash. They actually are dried green beans, which might seem like a less than helpful use for them. However, the beans you buy for soup in the store come from this source. When we’re done canning green beans for winter, we let the remaining beans dry on the vines. We then pick them off, shell them, and use them in soups or for baked beans. In fact, anywhere you’d normally use dried beans you can use the dried green beans from your garden. Our dried beans are a beautiful shade of brown this year. We’ve had speckled beans, solid black beans, and a number of other colors, all of which contribute to a colorful soup, even if they taste mostly the same. You simply remove the pod by shelling the dried green bean and you end up with handfuls of beans you can store without much fuss at all. In short, green beans are an extremely efficient way to produce food—you can eat them green or dried and they require no special storage when dried (an airtight container is helpful). Of course, this is also the time of year that I start getting into the woods to cut wood for winter. I’m actually bringing down wood that I cut and stacked last year (or two years ago in some cases). It won’t be quite enough for the entire winter, but it’s a good start. I’ll look for dead, dry trees to cut up to complete our wood supply for the winter, and then begin on next year’s wood. Rebecca helps by carrying wood from the cart, wood pile, or from the edge of the woods and throwing it into the basement—saving me a ton of time. Some of the wood has to be split, a good job for my maul on days when it’s too windy to cut wood. Self-sufficiency relies on a lot of equipment as well. During the summer months there is little time to maintain it. Yes, if something breaks, you have to take time out to fix it, but that’s not the same as maintaining it. During the fall and winter months, I’ll sharpen shovels and spades, repair equipment, change the oil, and tune everything up. These maintenance actions are essential if you want to have a good summer. Nothing is worse than trying to dig with a dull spade. Anything I can do to make our hand, electric-powered, and gas-powered equipment work better is money in my pocket and time to do something else. So these winter months are an essential time for me. This is also the time I’ll be working on new projects. For one thing, Rebecca needs a bit more storage and better lighting in the larder. I’ve been wanting some shelving for my equipment for quite some time now and I may get to it this winter. The chicks need something better than a refrigerator box—I’m planning to build a box that we can use as a combination of brooder (to keep young chicks warm) and rabbit house (during the summer months after the chicks are put outside). Still, nothing beats sitting by the wood stove after a day of cutting wood and feeling it’s warmth hit tired muscles. I’ll break out my Knifty Knitter to make some hats, scarves, blankets, and socks (you can see some of the things I’ve made in my Knitting for the Gentleman Farmer post). I may even engage in some latch hook this winter to make a rug or wall hanging. Winter is a time of crafting too! So, how do you enjoy the fall and winter? Let me know at John@JohnMuellerBooks.com.